Learn how this pipefitter and food lover went from ramen to steak and shrimp. As a union pipefitter apprentice, Savy Man-Doherty couldn’t be more fired up. 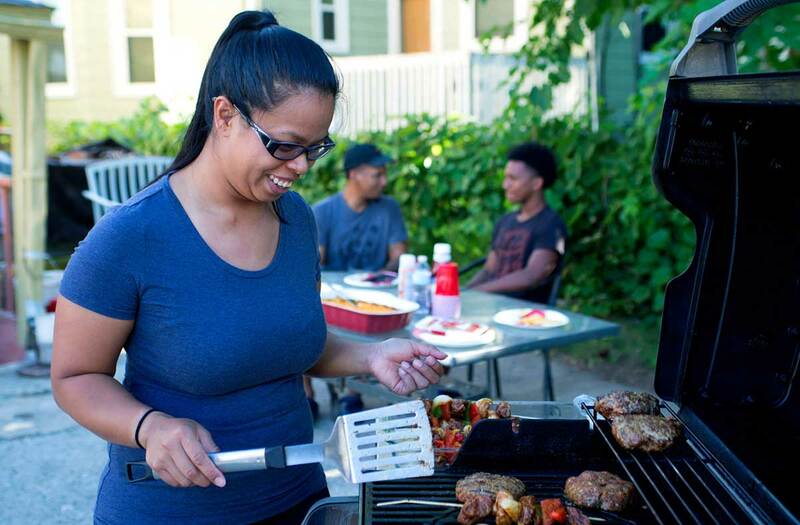 With an annual income of close to $70k, she rents a comfortable apartment with her boyfriend and helps support his children. They go out for dinners, but nothing beats a delicious home-cooked meal by Savy. Cooking is her favorite hobby, and with the life she’s building, she’s been to able make the most of it. Steak and shrimp sizzle on the grill. Sweet potato pie and other treats come out of the oven. And her backyard barbeque parties have become a hit with family and friends. Then came the email that gave her hope – Building Pathways was looking for women to work in construction. Savy took the initiative to learn more, and during the information session, she was encouraged to see so many women. She also liked what she heard about a career in construction. “I knew right away this is what I wanted to do,” recalls Savy. Now, she is working on the Encore Boston Harbor project in Everett, Mass.